Maj. Lonnie Campbell remembers when he was 19 years old and a new member of the Canadian Armed Forces Reserves in Calgary, Alta. in 1987. He had signed up for the Forces because he had pride in his country and he wanted the chance to serve it. He also wanted to follow in the footsteps of his family members before him. Campbell’s grandfathers and great uncles served in the Second World War and his father was in the Royal Canadian Airforce. During a phone interview from the Drawsko Pomorskie Training Area in northwestern Poland on Nov. 3, Campbell, 49, recalled a memorable experience when a First World War veteran came to speak to the reservists soon after he had first joined. The former soldier, Sgt. Wally Bennett of the 10th Battalion, Canadian Expeditionary Force, gave an inspirational speech about a particularly costly and famous battle during the war – the Second Battle of Ypres in April 1915. The veteran told them about the use of poison gas by the German forces and how the Canadians counter-attacked and defended the Allied line against subsequent gas assaults. Thirty years later, the topic of remembrance has become more personal for Campbell. The experienced soldier has been a member of the Canadian Armed Forces (CAF) for almost 30 years. During that time he has served on numerous operations in the Balkans, Afghanistan and now in Poland where he commands the Land Task Force for Rotation 6 of Operation Reassurance. He completed two tours in Afghanistan from 2005 to 2006 and in 2008 with the Princess Patricia’s Canadian Light Infantry. It was there that Campbell, like many other CAF members, witnessed the true cost of war. 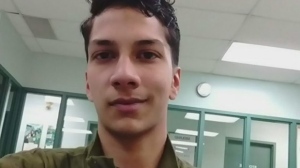 “All of us know people who have been killed in action or wounded,” Campbell told CTVNews.ca. For this year’s Remembrance Day, Campbell said he’ll be attending a ceremony at a commonwealth war cemetery near Warsaw, Poland. He said CAF soldiers stationed in Poland would be going to local civic events in the town. As the country prepares to commemorate the sacrifices of former soldiers at Remembrance Day ceremonies across Canada, it’s an opportune time to explore where soldiers, like Campbell, are presently stationed. As of July 2016, there are approximately 1,100 CAF members deployed on operations around the world. Here is a look at the 14 active missions Canadian troops are currently supporting. Following Russia’s encroachment in Ukraine in February 2014, CAF members were deployed to Central and Eastern Europe as part of NATO’s Response Force to increase their presence in the region and deter Russian aggression. 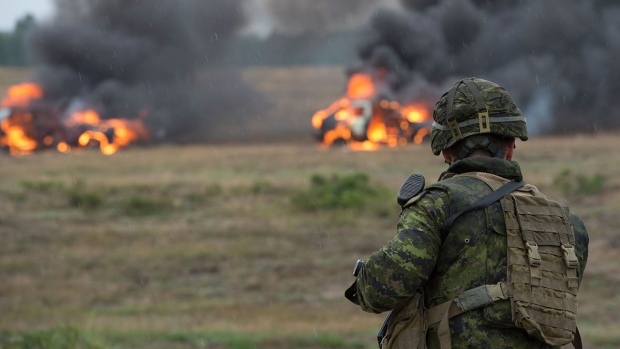 Canada’s contribution to the effort was dubbed “Operation Reassurance” because of its goal to reassure Eastern European nations of NATO’s support for their security and stability. Currently, there are approximately 220 CAF troops conducting training exercises which focus on collaboration between NATO allies and partner nations in countries such as Germany, Lithuania, Poland and Romania. There are currently five CAF personnel stationed in Pristina, Kosovo providing logistical support to a NATO-led peacekeeping operation called the Kosovo Force (KFOR). The KFOR operation was established in 1999 after NATO’s air campaign against former Serbian president Slobodan Milosevic’s regime. Canada has been supporting KFOR periodically since its formation. Operation Snowgoose is one of Canada’s longest-running overseas missions dating back to 1964. It is Canada’s contribution to the United Nations Peacekeeping Force in Cyprus (UNFICYP). The UNFICYP was originally sent to monitor a ceasefire between Greek and Turkish Cypriots in 1964. There is currently only one CAF officer stationed at UNFICYP’s headquarters in Nicosia, Cyprus who provides operational support. More than 25,000 CAF have served as peacekeepers in Cyprus since 1964 and 28 of them have died in the line of duty. The bulk of the Canadian contingent was withdrawn in 1993. Since September 2015, about 200 CAF personnel have been deployed to Ukraine as part of Operation Unifier, a joint support mission between Canada, the U.S., and the U.K. The mission’s primary objective is to provide training to the Ukrainian military to help them defend against Russian aggression. Since the beginning of Operation Unifier, more than 2,100 Ukrainian soldiers have been trained, according to Canada’s Department of National Defence. There are currently nine CAF troops with expertise in infantry, artillery, engineers, communication and training stationed in the cities of Kinshasa and Goma in the Democratic Republic of the Congo (DRC). The operation is Canada’s contribution to the UN’s stabilization mission known as MONUSCO. The UN peacekeeping mission was created in May 2010 to protect civilians from violence and to monitor an arms embargo imposed by the UN in 2009 in the aftermath of the Second Congo War. The 10 Canadian troops deployed in South Sudan contribute technical planning and operational expertise to the UN peacekeeping mission there. After South Sudan officially became a state in 2011, civil war broke out in 2013 which among rival factions which lasted more than two years and resulted in tens of thousands of deaths and the displacement of millions of residents. Although the civil war is supposed to be over, renewed fighting between the two sides in the summer has caused instability in the country. The UN’s objective is to protect civilians, monitor and investigate human rights abuses, help with the delivery of humanitarian assistance and support the implementation of an agreement to end hostilities. Canada has had peacekeepers stationed in South Sudan since 2004. Operation Calumet is Canada’s contribution to the non-UN peacekeeping operation by Multinational Force and Observers (MFO) in the Sinai Peninsula in Egypt. There are approximately 70 CAF members serving in El Gorah, Egypt with expertise in logistics, engineering, training and a flight-following unit. Since March 2015, the Canadian contingent also includes military police officers. The MFO was established in 1981 by the U.S. with Egypt and Israel to monitor and protect the Egyptian-Israeli Treaty of Peace. CAF personnel have been involved in the MFO mission since 1985. There are about 15 Canadian troops contributing to a multinational, U.S.-led counter-terrorism effort in the Middle East, North Africa and Southwest Asia. The CAF personnel work as staff members at U.S. Central Command Headquarters (USCENTCOM), U.S. Air Forces Central Headquarters (AFCENT) and Combined Maritime Forces Headquarters (CMF). They also act as liaisons between Canada and the host facilities. The headquarters are located in Tampa, Fla., Qatar, Bahrain and Jordan. Operation Foundation was established in August 2003. Operation Impact is Canada’s contribution to the U.S.-led multinational coalition fighting against ISIS in Iraq. There are approximately 830 CAF members stationed in Iraq under Operation Impact. The mission includes air operations, training and advising to Iraqi forces and regional capacity building. Canadian troops on the ground are involved in training, advising and assisting Iraqi security forces in developing their military skills. After Prime Minister Justin Trudeau pulled out Canada’s fighter jets in February 2016, the air mission no longer included conducting air strikes on ISIS targets in Iraq and Syria. Instead, Canada’s contribution to the air mission includes providing surveillance and a refuelling aircraft. CAF personnel are also trying to increase security and stability in the region by encouraging military cooperation among regional forces to prevent violent extremism. Canada’s contribution to the multinational coalition against ISIS began in the fall of 2014 after President Barack Obama authorized a targeted military intervention in Iraq. CAF members deployed under Operation Proteus take part in training and supporting the Palestinian Authority Security Forces (PASF) as part of the Office of the United States Security Co-ordinator (USSC). The USSC was developed in 2005 to encourage co-operation on security matters between Israel and the Palestinian Authority and to develop the security infrastructure in the West Bank. The Canadian contingent also works closely with the Canadian government personnel in the region to help the Palestinian Authority protect its civilians and promote peace in the Middle East. At the request of Global Affairs Canada, CAF members have been serving in support functions at the Canadian embassy in Kabul, Afghanistan. According to Canada’s Department of National Defence, the number of troops stationed there is “limited” and the embassy’s security requirements are not discussed out of concern for safety. Operation Addenda began in May 2014 when 16 CAF personnel were sent to the Canadian embassy to protect the ambassador and staff. There are currently four CAF members working as UN military observers as part of the UN Truce Supervision Organization (UNTSO) in the Middle East. The Canadians work with two UN observer groups in the Golan Heights and in Lebanon. Observer Group Golan supports the UN Disengagement Observer Force (UNDOF) between Israel and Syria and Observer Group Lebanon supports the UN Interim Force in Lebanon (UNIFIL). Operation Jade is Canada’s longest-running overseas commitment with the first Canadians deployed in 1954. There are five CAF members serving in senior appointments at the Port-au-Prince military headquarters for the UN’s stabilization mission in Haiti, known by its French acronym MINUSTAH. The UN mission began in April 2004 after a revolt ousted the president and the interim president asked for help in restoring peace and security. MINUSTAH was initially supposed to be only six months long but it has been repeatedly extended over the years. As of June 2016, MINUSTAH includes 2,360 military personnel and 2,169 police from Canada and 18 other nations from around the world. Operation Caribbe is Canada’s involvement in a multinational effort to prevent illegal drug trafficking by organized crime in the Caribbean Sea and the eastern Pacific Ocean. Canada currently has three Kingston Class ships and approximately 120 CAF members supporting the operation. HMCS Kingston has been patrolling the Caribbean Sea since Oct. 18, 2016. HMCS Brandon and HMCS Edmonton have been monitoring the eastern Pacific Ocean since Oct. 25, 2016. As part of Operation Caribbe, Canada sends ships and aircraft to support Operation Martillo – a joint, multinational effort led by the U.S. to counter the illicit drug trade on the seas since 2012.